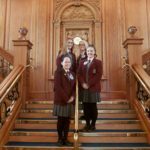 On Tuesday 7th March, four year 13 students from Ulidia Integrated College went to the Titanic Belfast’s 4th International Women’s Day conference, Inspire 2017.
International Women’s Day encourages effective action for advancing and recognising women and the 2017 theme, Be Bold For Change, reminds us all that ‘we can collectively help women advance and unleash the limitless potential offered to economies the world over’. Chloe, Toni, Aimee and Kyna had the opportunity to hear from guest speakers, performers and exhibitors who empowered them to use their talents and abilities for the betterment of everyone. 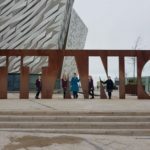 They also took part in a mentor walk where they had the chance to walk around Titanic Quarter with Stephanie Harvie from Snowglobe Coaching, who is passionate about encouraging young women to reach their potential. At the end of the conference, our four young women took a pledge to Step Up and Be Bold. The energy and the confidence of the young women in the room was palpable. 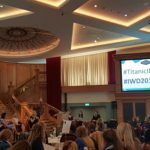 This was a fantastic event and we cannot wait for next year’s conference. Until then, here is what our young women have to say about the event. “Today was an inspiring and interesting day which taught us women to be BOLD. We met some very influential women, from successful business women to artists/singer with their own very individual stories. The day consisted of speeches from the inspiring women, a conference with them, a walk with the mentors, a question and answer session, lunch and a lot of laughs. I found it very eye-opening and encouraging to hear the backgrounds and stories of the influential women; they shared their stories with us on how they have become so successful within their jobs and what journey they went through to reach their goals.